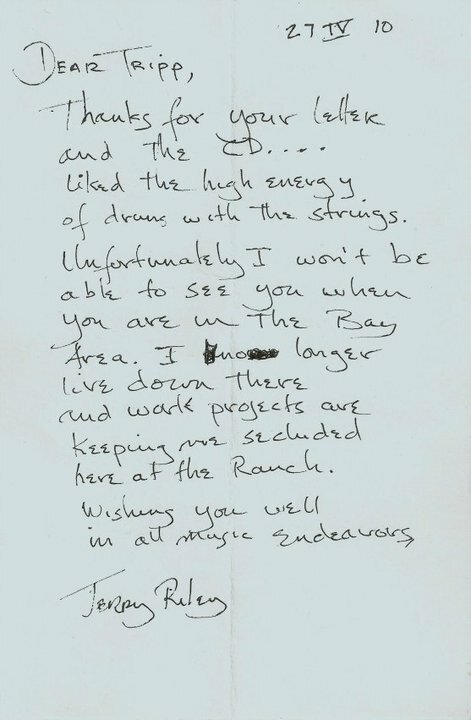 I Got a Letter From Terry Riley…. 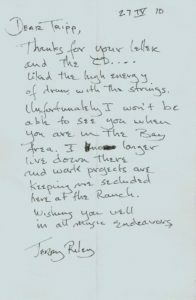 In 2010 I sent Terry Riley a letter asking him to come see my band Bongo Fury when we were playing in Oakland that summer along with a CD of a string quartet piece I had written. To my astoundment, he wrote me back. My hands shook with excitement when I pulled that letter out of the mailbox and realized who it was from. In 2012 I went on a 36 hour trip to New York City and saw the premiere of one of Mr. Riley’s pieces at Carnegie Hall. I remember standing in line to shake Terry Riley’s hand at the end of the concert. A recently graduated Julliard student and his grandmother stood in front of me telling me how much he loved Terry Riley’s music. How his grandmother had been friends with Terry Riley since the 70’s. Before that had occurred, during intermission, I had drank champagne with a bunch of professors from Julliard explaining to them how I liked to crossdress and took lessons in South Indian Classical music. It was a heady affair. And somehow or another I manged to shake Terry Riley’s hand. I got nervous, mumbled how much I liked his piece. Told him I had written him a letter once and he had replied and how much I had appreciated that. Mr. Riley looked at me with puzzlement for a second, said he didn’t remember the letter, but thanked me nonetheless, what a cool person!